Just over a year ago, Chevrolet unveiled a stunning concept truck known as the Colorado Bison. It was developed in conjunction with American Expedition Vehicles, and although most of us dreamed of seeing the idea brought to fruition, we hadn’t maintained high hopes. Then to our great surprise, the pair moved forward with production, delivering what is easily the most capable and well-equipped mid-size truck on the market. 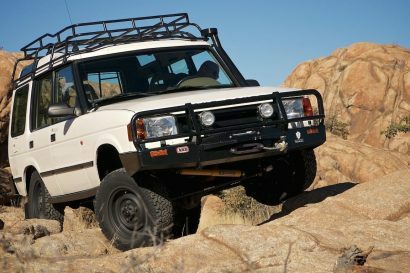 But the question remained, how would it actually perform on the trail? Well, we finally got that answer on a remote desert track outside of Phoenix, Arizona, and the Bison did not disappoint. First things first though. 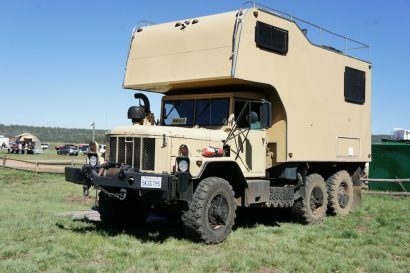 For those who aren’t familiar with the truck or didn’t read our initial coverage here, the Bison is unique because it comes equipped with almost everything overlanders would want right from the factory and under warranty. 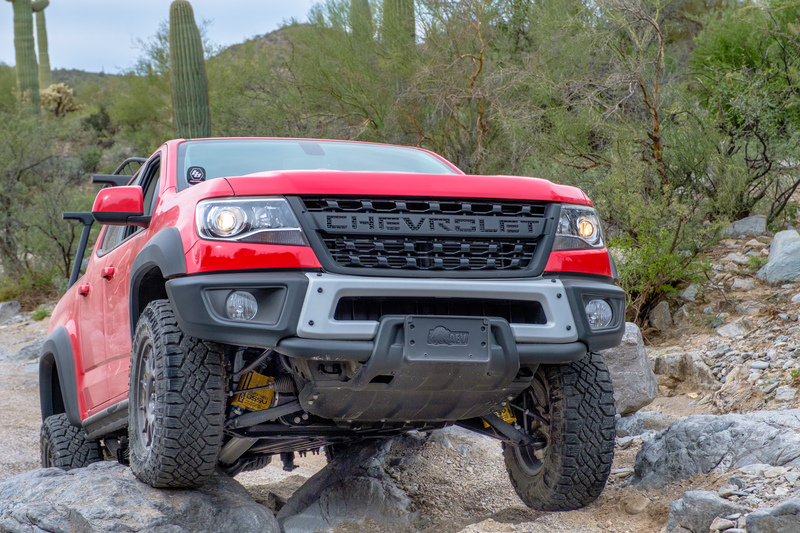 We’re talking front and rear electronic locking differentials, a winch-ready steel bumper in the front, with matching bumper and integrated recovery points out back, blacked out 17- x 8-inch wheels, 31-inch Goodyear all-terrain tires, and a 2-inch lift kit with Multi-Matic spool-valve shocks. 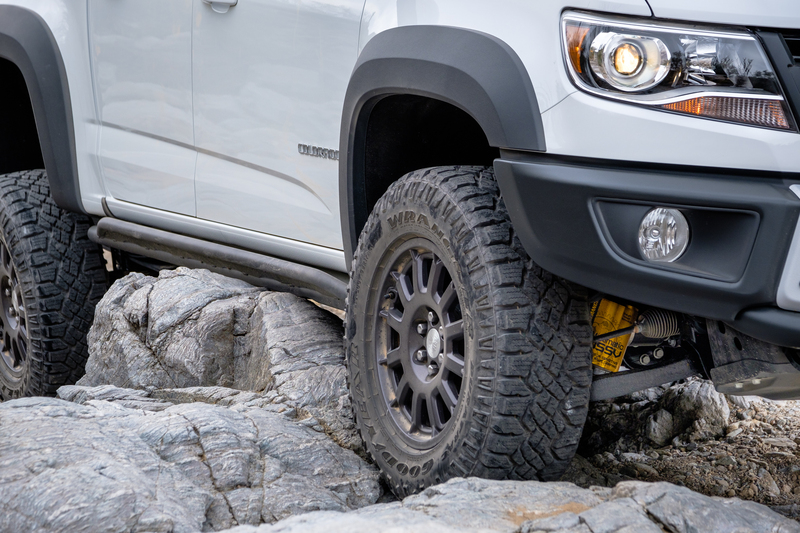 Like the standard ZR2, the track width has been widened by 3.5 inches to improve stability on the trail, while sliders and an additional set of skid plates armor the Bison’s undercarriage from front to back. 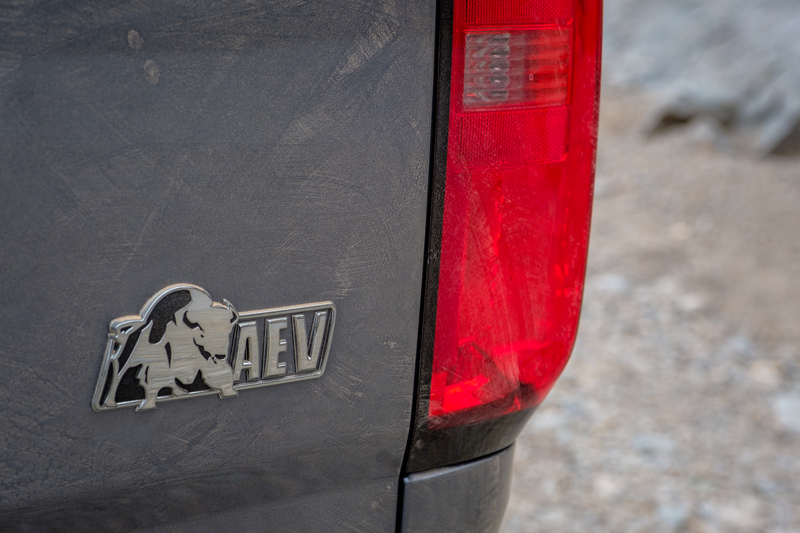 These aren’t just any skid plates by the way, but ones designed by AEV and forged from Boron Steel, a lighter and stronger material than they’ve ever used before. 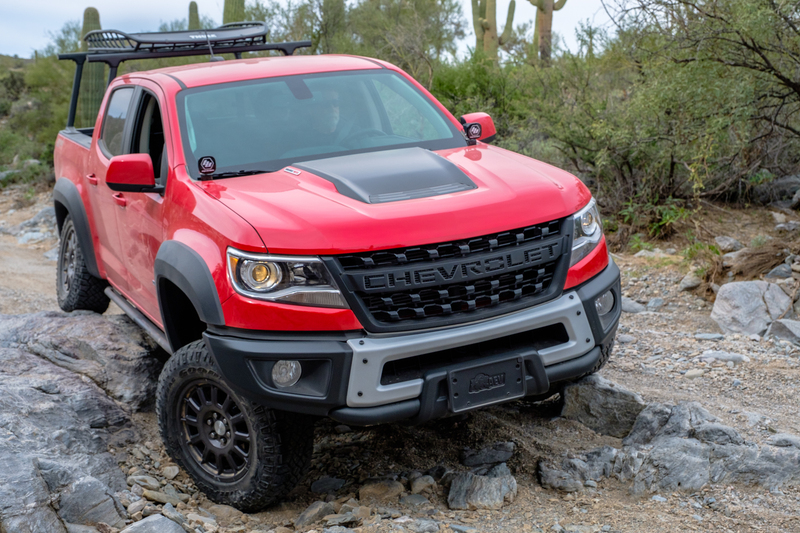 The trucks come standard with a 3.6L V6 pumping out 308 horsepower and 275 pound-feet of torque, or can be equipped with a 2.8L turbo-diesel producing 186 horsepower and 369 pound-feet of torque. There’s even an AEV snorkel and race-ready suspension upgrades that can be installed right at the dealership! So how does this beefed up ZR2 perform with all of this new kit? Well, lets take a look. 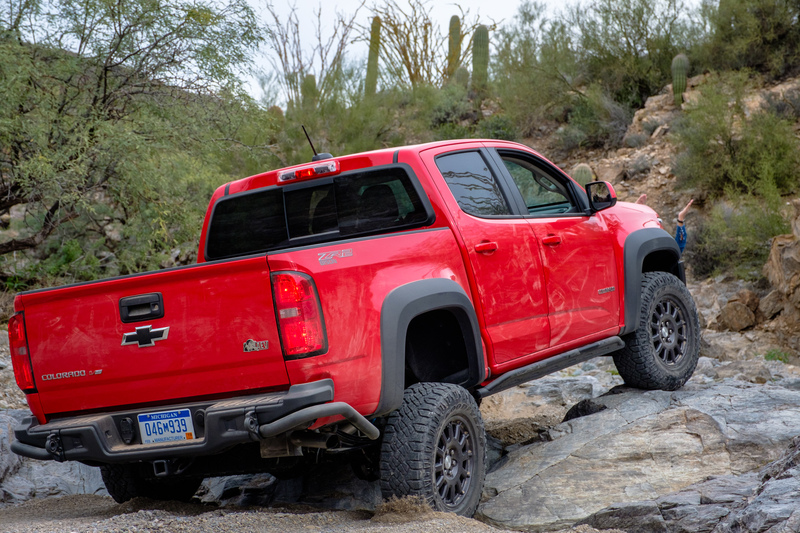 Our test started off with a 45-minute drive on highways and twisty two-lane roads, which gave us a chance to find out if the Bison’s road manners were much different than those of the standard ZR2. We were thrilled to see that it still cornered like a dream, with flat and predictable handling even when making abrupt maneuvers. 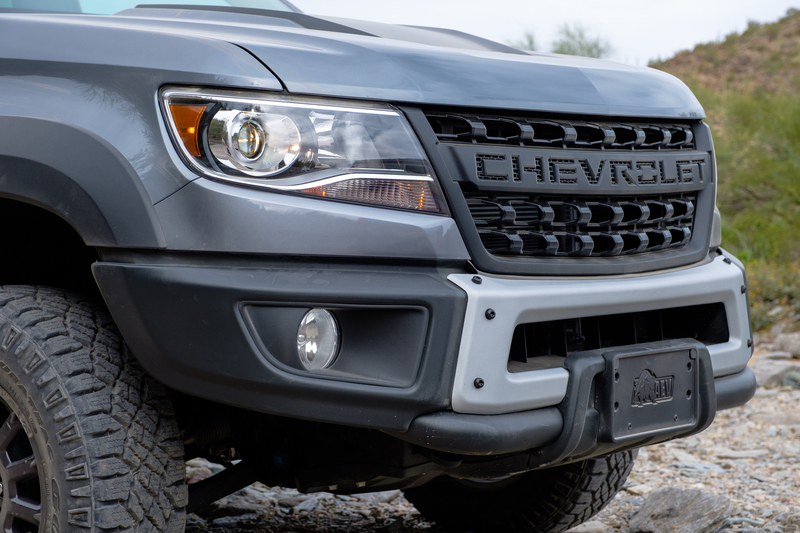 This mirrored the results of the Colorados we had tested previously and told us that the steel bumpers hadn’t made a noticeable impact on the truck’s road performance. 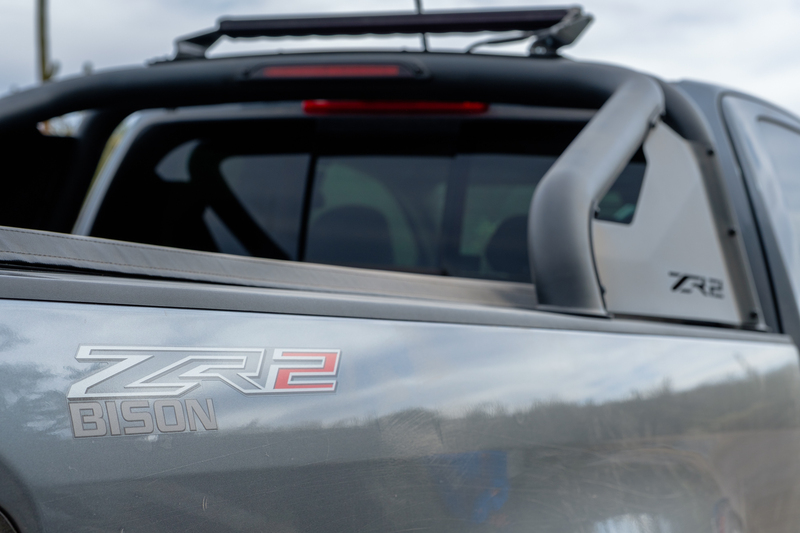 Since both the ZR2 and Bison behave identically on pavement for all intents and purposes, we won’t dive into those details here, but you can read more about them in our original article on the ZR2 by following this link. Once we reached the dirt, however, things did begin to change, and we had the chance to see what these trucks could really do, even if it was at full air pressure. The roads started out rather mild, with occasional embedded rocks, potholes, and washboards. The Bison absolutely excelled here, soaking up everything with an increasing ease the faster we went. 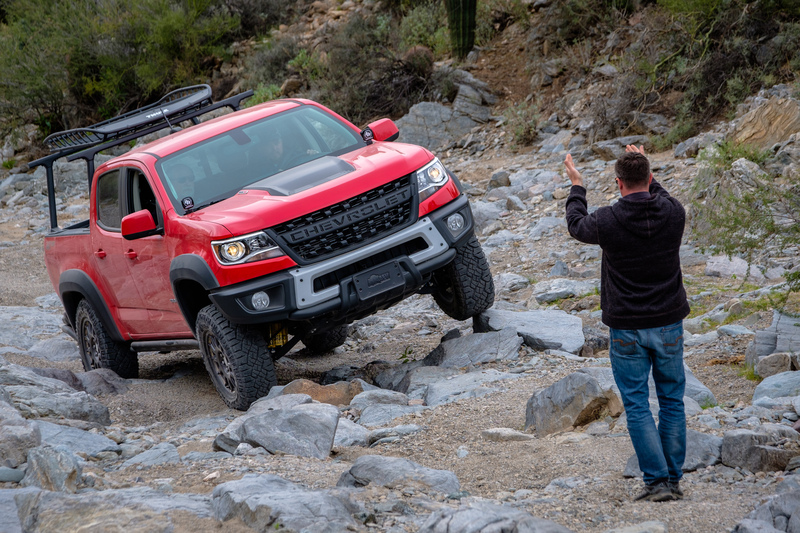 No surprise there, as we were already familiar with the heart-pounding performance of the ZR2 we had spent an afternoon jumping at 50 miles per hour two years ago. The Multimatic suspension glided over everything in its path, making us wonder just how smooth it would have been at 20 psi. Very, would be our guess. Before long, the track transitioned into a series of rock gardens with obstacles increasing in size and difficulty the further we went. We all shifted into low-range and slowed down to let the trucks work their way over and through the obstacles before us. Even without the tires deforming or the lockers engaged the Bisons made the trail look like a cake walk. The approach, departure, and breakover angles constantly surprised me by clearing rocks I thought for sure would hit, and the suspension articulated smoothly instead of the whole truck rolling back and forth like a skateboard. 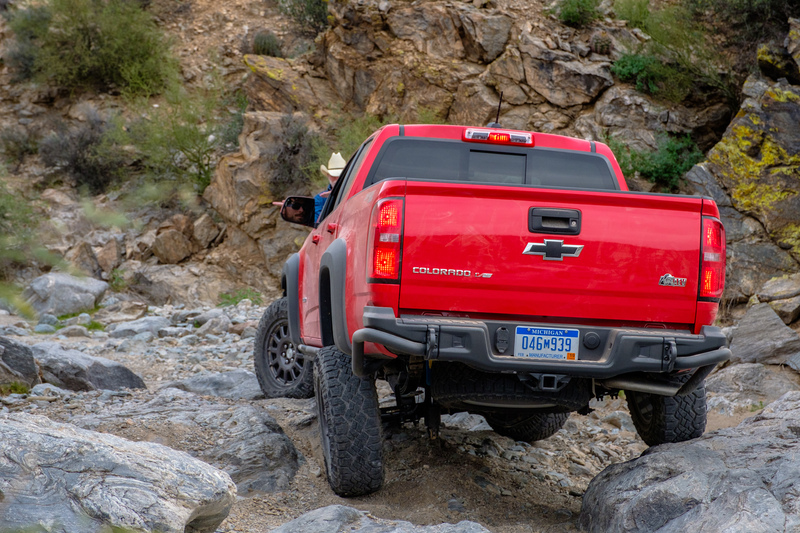 By the time we reached the midway point on the trail, I was feeling confident that I wouldn’t even need to use the skid plates, lockers, or sliders, but the Chevrolet team had other plans in mind. They eventually pointed us down a side track with rocks large enough to scare a few journalists and excite the rest of us. We would have to use the sliders here, and maybe even the lockers too. I pointed my Bison down the trail and like a kid on Christmas let the 2.8L diesel’s torque carry the truck gracefully over each obstacle in my path. The gearing felt perfect, and the throttle application was smooth and controllable with no discernible surge from the turbo. By the time I reached the crux of the trail, I flipped on the rear locker just to make things easy. Hey, if you’re paying for those expensive features you might as well use them. The bison stretched out gracefully as we entered the cross-axle scenario, but didn’t spin. At the peak, the sliders kissed the rock ledge and then smoothly slid off and over the other side. Easy as could be. Others didn’t do quite as well, giving me the chance to see how the boron steel skid plates and standard steel sliders held up to abuse. Turns out, they work phenomenally well, absorbing each strike with light scratching on the paint and no significant gouging. The diesel exhaust pipes, on the other hand, weren’t so lucky. Most were crushed or dragged on the rocks as they navigated the terrain, many to a level where I imagine it must have impacted performance in some way. 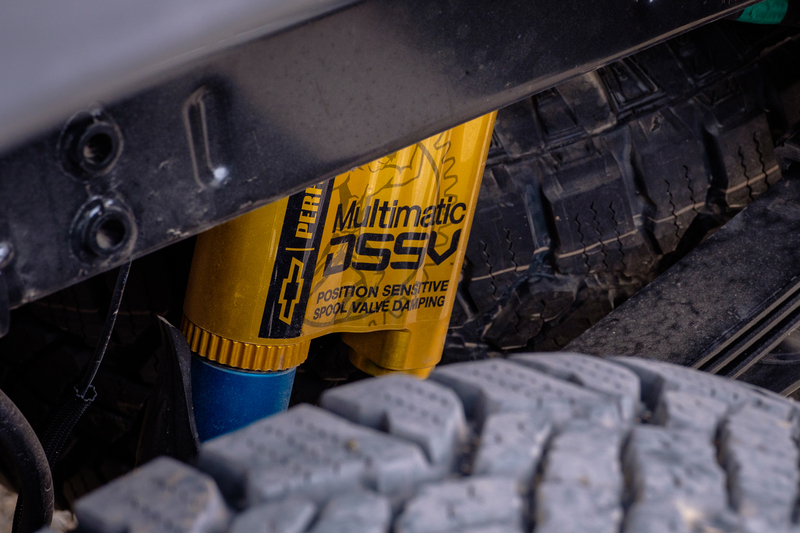 If you purchase a diesel model, modifying your exhaust will be a must, or the trail will surely modify it for you. Truth be told, we’ve struggled to find fault with the Bison. 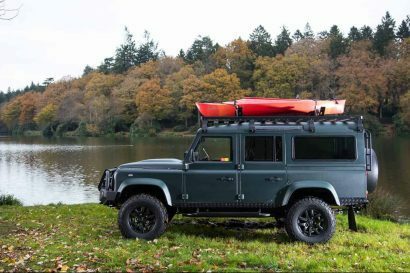 It performs flawlessly on the trails and matches that off-road capability with road manners so good they’ll make you forget you’re behind the wheel of a four-wheel drive. The leather, AEV-embossed seats are extremely comfortable, the sound system is great, and we were getting over 20 miles per gallon while cruising at 75 mph down the highway. Even the price is reasonable, coming in at a mere $48,045 for what’s essentially a fully loaded V6 extended cab. 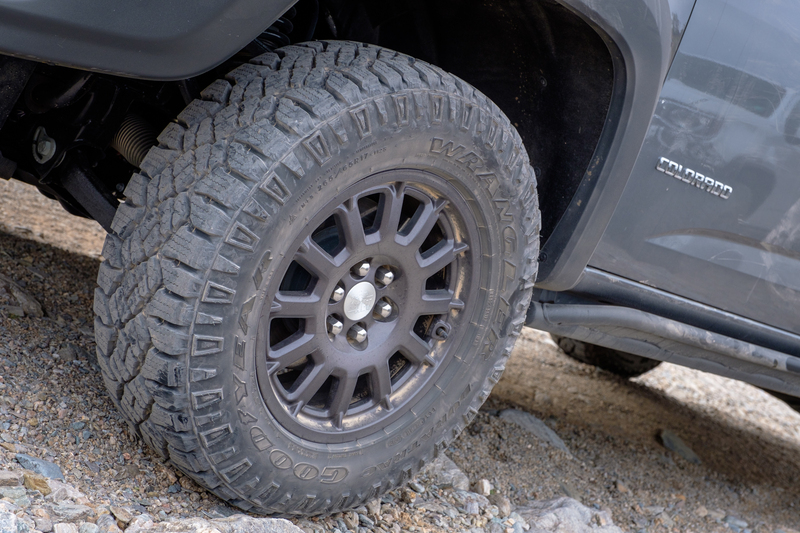 Our only criticism outside the diesel’s exhaust location is that we’d love to see 33-inch tires as standard, but given that they should fit without any modifications we can’t really complain. The Bison then is everything we had hoped it would be and more. 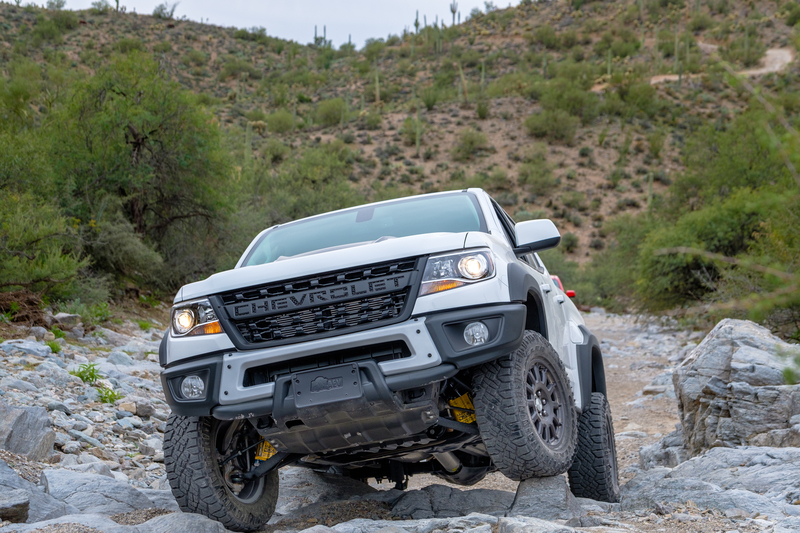 It is the midsize truck we’ve been asking for—the locked, lifted, diesel that can tackle daily driving and trails with equal ease, all without a single aftermarket part. Which leaves only one question left to answer; where will you take yours? 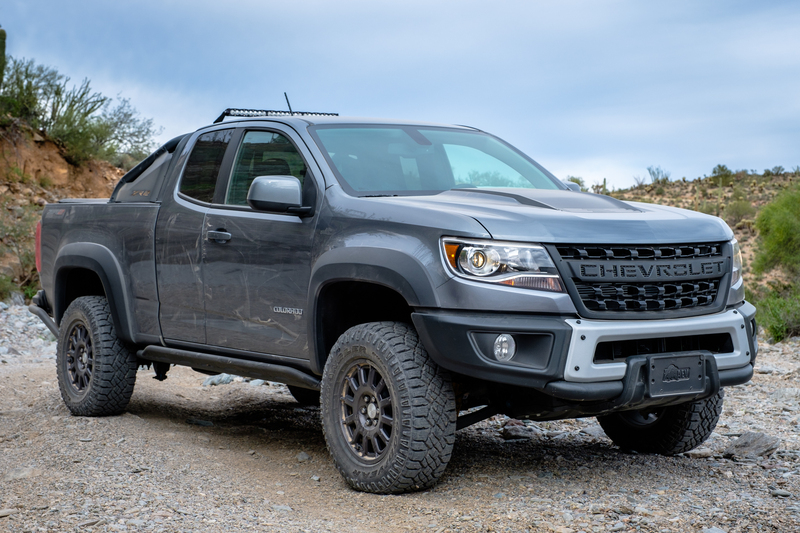 A few weeks ago we probably would have just ended this article above, wrapping things up in a neat little package with Chevy’s Colorado Bison standing atop the midsize market as the most well-equipped and capable truck available. BUT, that was before the Gladiator. With Jeep’s recent unveiling many of us have wondered just how it will affect things in the marketplace. 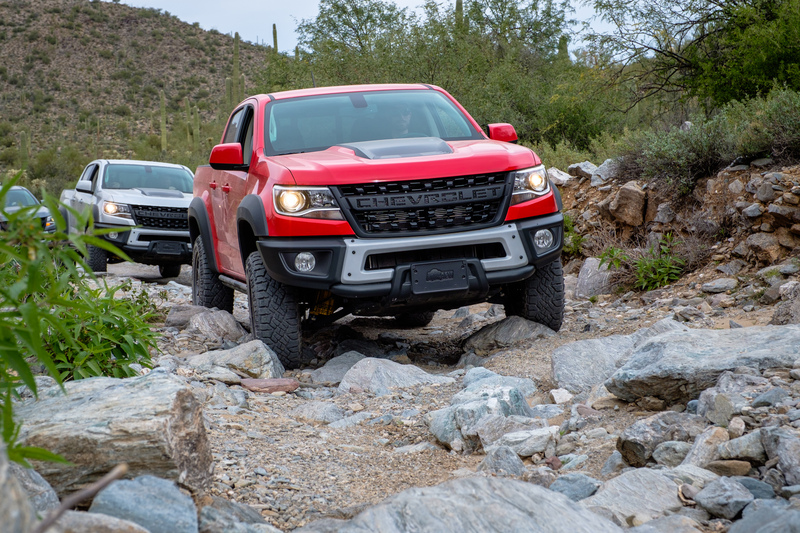 Head to head against the Bison, the Gladiator will almost certainly reign supreme on the rocks, but then it will also fail to compete on higher speed dirt roads where the Colorado’s MultiMatics have room to stretch their legs and its independent front suspension becomes an advantage. Both will be available with diesels, and from the looks of things, can be equipped with an almost identical array of options. The true battleground then will likely not be on the dirt, but on the showroom floor over price. Based on the JL Rubicon’s price of $49,215 when equipped with similar options to the Bison, plus the large premium it will probably cost buyers to move up to the Gladiator, we’re guessing that the Chevy’s price of $48k will be looking quite affordable in comparison. Still, that’s not going to win the Bison’s battle. 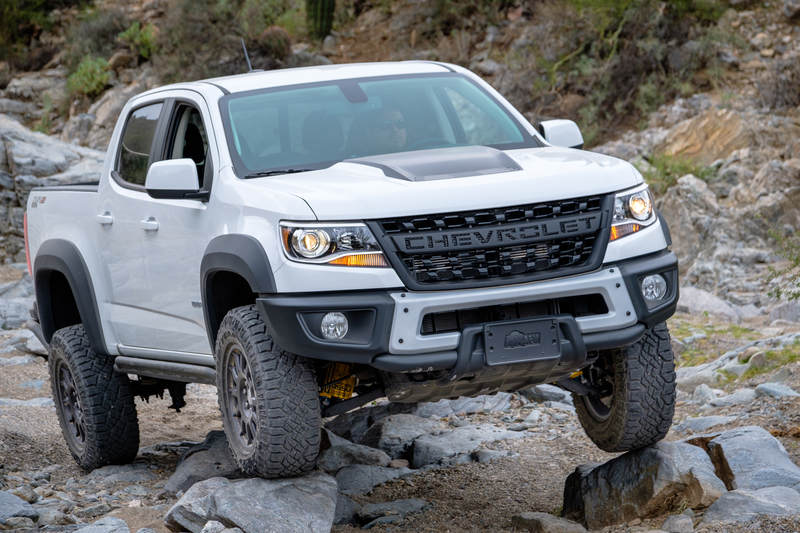 As amazing as this Colorado is, and IT IS AMAZING, the Gladiator will be tough competition. It is undeniably one of the best-looking and most anticipated trucks that we’ve seen in years, and it will also be packing some of the most effective off-road technology that Jeep has ever produced. If we can say one thing for certain, it’s that the next few years are going to be extremely interesting, and we can’t wait to watch how this battle unfolds.